These pink peppermint cupcakes were inspired by the infamous grasshopper pie. You haven't heard of Grasshopper Pie? 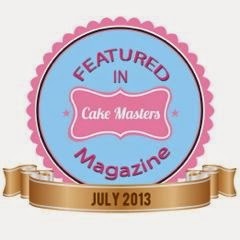 Well, you are just going to have to google it yourself, I have a blog post to write! My cupcakes evolved from the design in my head of a peppermint cupcake atop an Oreo cookie encased in a silver cupcake case and topped with a creamy white frosting and a sprinkle of chocolate was brought to a rather abrupt halt by a severe lack of silver cupcake cases in the County of Gloucestershire, well the three shops that I had the chance to visit anyways. And so, these are my pink peppermint cupcakes, still a surprise Oreo in the bottom, but now topped with a creamy and light pink peppermint frosting. 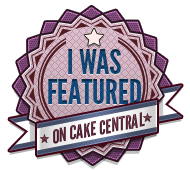 Most traditional sponge cake recipes are an approximation of this traditional equal measures recipe. Cream together the margarine or butter, sugar and a teaspoon of the peppermint oil with a stand mixer, hand mixer or wooden spoon until light and creamy. Fill the cupcake cases with the batter until they are about two thirds full. Bake at 180 C or 350 F for 15 to 20 minutes. 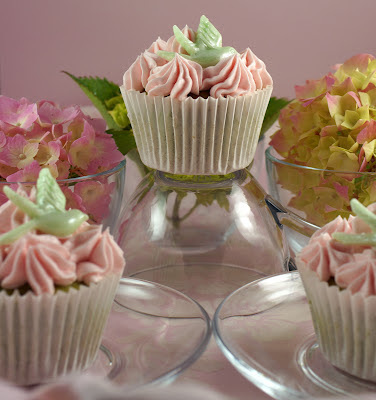 I delayed making these cupcakes for days, whilst I mused on what the frosting should be, then, I developed this recipe to be white because I wanted the frosting to have the look of whipped cream on top of the cupcake and then I decided to make the frosting pink! Mix the solid vegetable fat with about half the sugar and beat in a mixer or with a hand mixer until smooth. Add 2 teaspoons of peppermint oil, mix in and then taste. Add a bit more peppermint if you like it more perpperminty. Add a couple of drops of gel food colouring if you like. 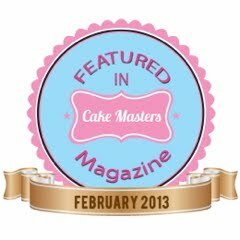 I used a tiny amount of Wilton Rose. 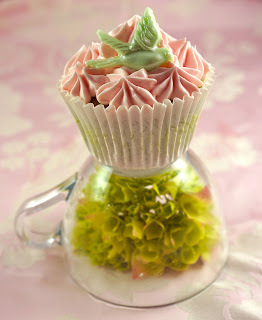 Hold the nozzle perpendicular to the cupcakes to get this flower effect. Squeeze slowly and pause before lifting the bag. 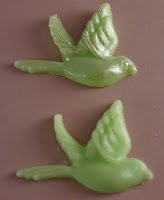 Mould the birds by pushing a small amount of fondant into the mould. Press down gently and remove any excess fondant. Then gently flex the mould and lift the moulded fondant out. 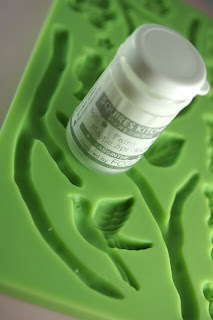 If you find your fondant is stretchy and or sticky, pop the fondant into the fridge for 20 minutes and then try again. 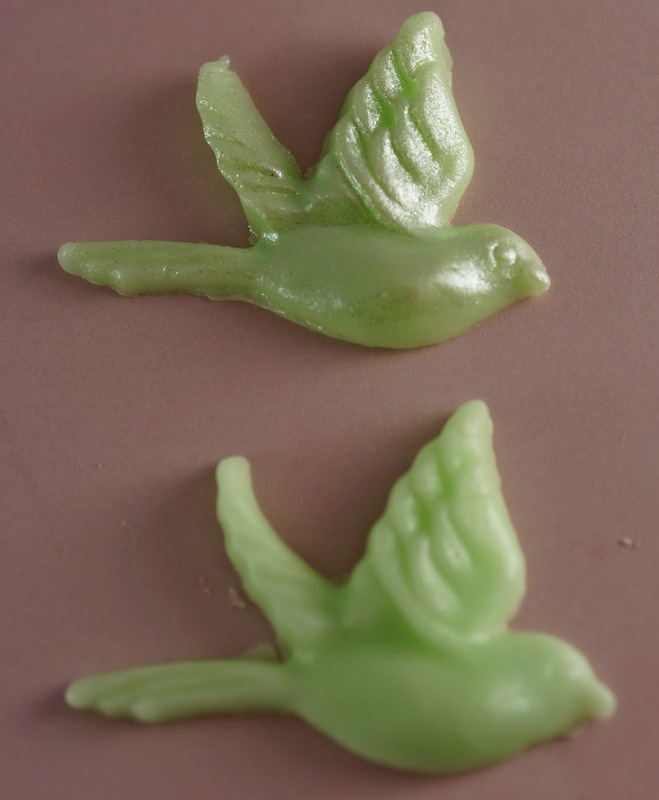 I thought you might like to see the difference between the bird moulded in fondant and what it looks like when it is brushed with the lustre. Pop one of the birds on top of each cupcake and you are finished.